If you’ve ever found yourself stuck in traffic, wishing you could just fly above the chaos, you might soon get your wish. Aeronautics giant Airbus has announced a new plan, dubbed “Project Vahana,” that would create a fleet of on-demand autonomous drones to carry passengers through the skies. And if that doesn’t sound crazy enough, the company says it could begin testing as soon as 2017. Much like Uber, passengers would use an app to book passage on the craft, and then travel to a local helipad. There they would board a CityAirbus drone along with other travelers, and be “whisked away to their destination.” Not only would this service be faster than a regular taxi due to its ability to avoid traffic, Airbus is planning to keep the price in the same range as a taxi ride, too. Any luggage would be carried by a separate service. While Airbus doesn’t anticipate problems with taking to the skies with current technology, training these taxis to be autonomous is going to be a challenge. We still haven’t perfected self-driving cars – how likely is it that we’ll have what are essentially self-driving helicopters available anytime soon? Don’t expect to see any large passenger drones in your city’s sky in the near future. 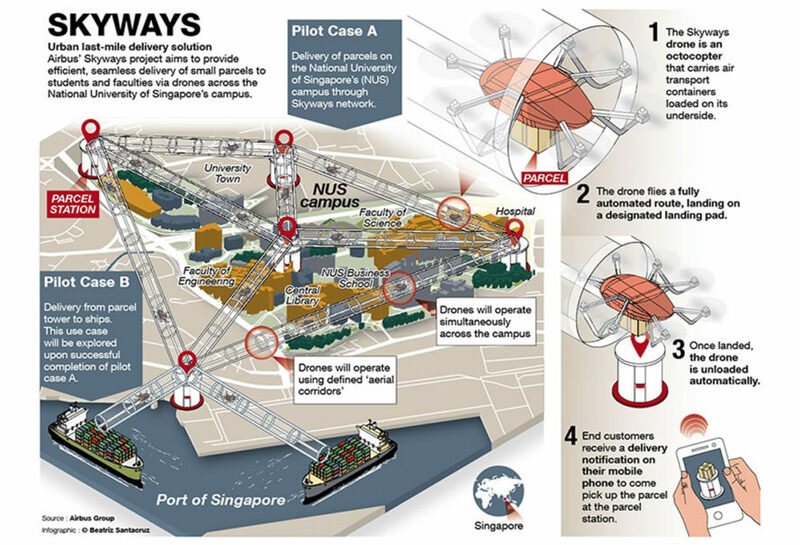 Right now, Airbus has set its sights on a drove delivery system, which will be tested in Singapore next year. If the delivery drones work well, the company hopes they could help ease potential customers into the idea of traveling by drone in the future. Airbus plans to begin testing on a self-driving air taxi as soon as next year. Much like Uber, passengers would use an app to book passage on the craft, and then travel to a local helipad.